Most fears, including children’s fears, are irrational. 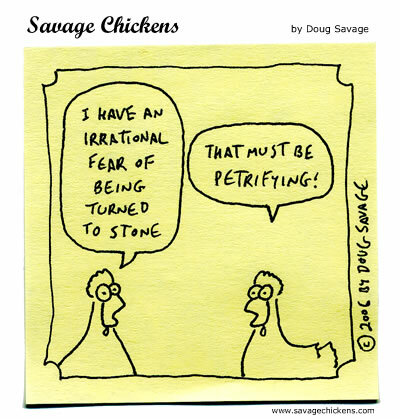 So here’s a joke about irrational fears. Then an Emotional Fitness Training tip for parents. Fear first appears in children somewhere between six and eight months when an unfamiliar face appears evokes cries of terror. The fear of strangers signals the baby now knows his care takers from other people. It also signals one of the main reason all people feel fear or fear’s cousin’s anxiety and worry. That reason? Fear of the unknown. Step one: Always do a quick reality check. Building on fire? Fear needs to be listened to. Tornado approaching? Take shelter. Child running toward danger? Stop the child’s forward progress anyway you can. Step two: ignore the fear. Remember the song from the King and I: “Whenever I feel afraid, I hold my head erect, And whistle a happy tune, So no one will suspect I’m afraid.” It works and by acting as if there is nothing to be afraid of, fear flees. With children, the smaller the child and the greater the fear comforting is the major strategy. As the child acquires language, murmur the words “Safe” or “Okay” becomes important. As the child grows encouraging efforts to face false fears can also grow. In time, discussions about fears and life threatening dangers need to take place. As noted when I last blogged, a move was pending. We are now nine days into our new home. Many boxes unpacked. Most stuff, and there is too much of it, is at least in the room that will be its final resting place. Need to throw even more out, but not now. Back on-line, but not consistently. My connection cuts out unexpectedly. Then getting back on IS not simple. Printer not working. Not even mosquito bites in the scheme of what matters. Still trying to figure out how to work smarter, not harder. Posting on this blog weekly. If you want more of me, try my Facebook or Pinterest persona. The EFTI Store is up. You will find some free posters amid ones for sale. A new free one goes up almost every day. Not sure what a poster coach is or how to use it. You are not alone. What works for kids also works for adults. Poster coaches encourage practice of one of the Twelve Easy Emotional Fitness Exercises. Most focus on Thinking About What Matters. Some try to provide you with a little laugh. Here are other ideas for using them. Enough said for now. I need to get this posted. This brief post was the result of this Daily Prompt: Fright Night What’s the thing you’re most scared to do? What would it take to get you to do it? This entry was posted in Emotional Fitness (Emotional Intelligence) Tips and tagged Emotional fitness, Emotional Fitness Training, Emotional Health, emotional intelligence, Emotional Meltdowns, Katherine Gordy Levine, parenting, Parenting advice, postaday, Poster coaches, Practicing Kindness, Self-care. Bookmark the permalink. Glad to hear you are all moved into your new abode. I’m sure the glitches will be ironed out soon. Great to see you back here again. Keep smiling!